Crafted in lustrous 14ct white gold, this mesmerising 1/4ct diamond shaped band from the Ever Us range is set with dazzling diamonds to symbolise the long term commitment between you and your best friend, your true love. Made to fit seamlessly with the Ever Us two stone diamond rings, this stunning piece is designed to be treasured. 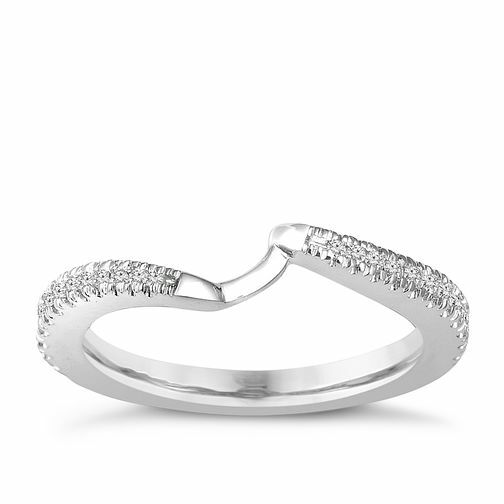 Ever Us 14ct white gold 0.25ct diamond shaped band is rated 1.0 out of 5 by 2. Rated 1 out of 5 by Anonymous from Doesn’t match engagement ring My fiancé proposed to me with a 1 carat ever us engagement ring. I absolutely love it and would not change it for the world. He told me that even though it had a unique shape that a matching band could be ordered from the same range at Ernest Jones. This is where the problems started... I went to four Ernest Jones trying to find this matching band. It was on the website, but there are three different carat sizes and I wanted to make sure I picked the right one. I was eventually told I would have to order online as they are not stocked in store. When I went online I thought I would ask the online help team if they knew. They also were unable to tell me what carat sizing would match my engagement ring. I decided through process of elimination that as my engagement ring was one of the larger carat sizes, I would buy the biggest carat weighting wedding ring. The website said it would take up to 8 weeks to dispatch, so again a long wait. I got it dispatched to the Kingston branch so I would be able to try it on in store just in case there was a problem. My fiancé and I went into store yesterday to pick it up. I was so excited. That excitement was quickly thwarted by the ring that came out of the box. The diamond were ridiculously small compared to the ones on my engagement ring. What was worse however is that the two ring didn’t sit properly with each other, even though they are meant to. I was so upset. Even the store staff couldn’t get these rings to sit flat together even with the rings off my finger. The only good thing about the experience were the store staff. They were unbelievably sympathetic, but were not familiar with the range and had never seen the wedding rings before. I am now in the position of having no wedding ring that matches my engagement ring, and face the prospect of having to pay thousands for a custom ring to be made. I feel really let down by Ernest Jones for falsely telling my fiancé he would be able to get a wedding ring that matches. We’re going to be massively out a pocket. I’m 100% sure that my fiancé would not have picked such a unique ring without knowing we could get a wedding ring to match. Avoid at all costs unless you want heart ache or have thousands to spend on a custom wedding ring!! Rated 1 out of 5 by Anonymous from Poor quality and really disappointing. My husband brought me the 1.5 carat ever us ring for our wedding anniversary. We then ordered the 0.25 carat band to make it a bridal set. Went to collect it today and it looked like it had come from a cracker. Very flimsy, the band was not round, totally out of shape, and it looked like it had been squashed. To make it worse, it did not even fit snug to the ring. We waited 6 weeks for it to be made to fit my ring and so gutted when we saw it. Please do not buy.....you will regret it!!!! Thankfully for Suzanne, she sorted us out with an alternative, so huge thank you to her.